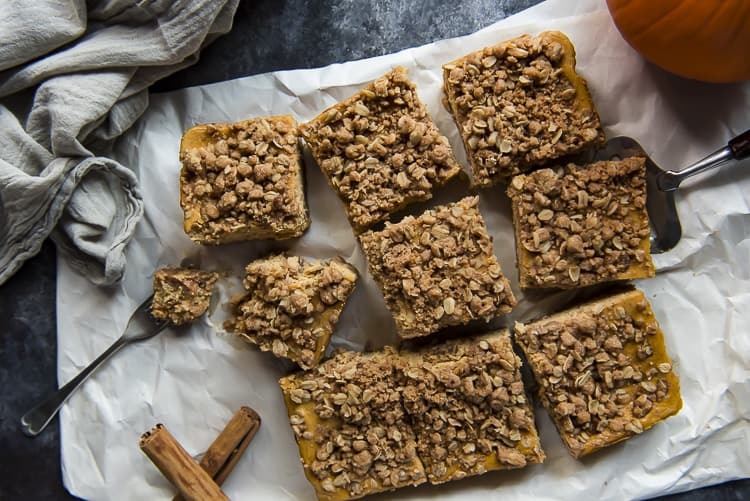 Delightful autumn flavors shine in these streusel-topped Pumpkin Cheesecake Bars! 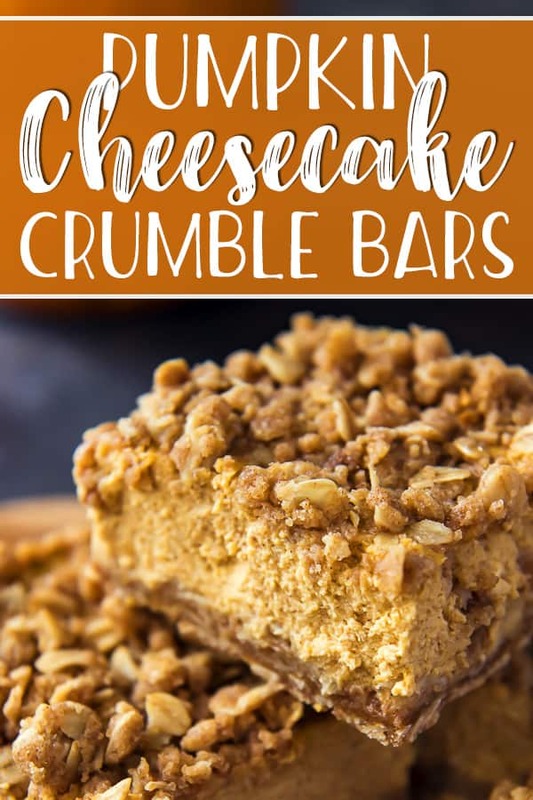 Creamy, smooth pumpkin cheesecake is baked in an oat-based crumble crust, then sprinkled with crunchy streusel – these bars might just be your new favorite fall dessert! We are super excited to be working with Eggland’s Best in 2018 to create a dozen delicious sponsored recipe posts to keep you drooling! Just when you thought I couldn’t cram one more pumpkin recipe into fall this year. I’m always full of surprises, friends! And this is a wonderful one! If ever there were two words that absolutely belonged together, it would be these. 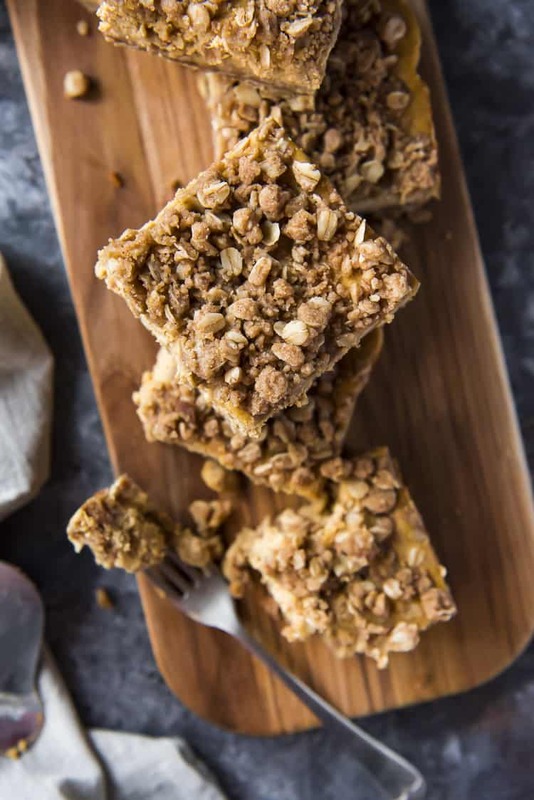 These have taken the crown as my new favorite fall dessert (for now), and it all comes down to the double duty-pulling streusel. JUST TAKE ME TO THE PUMPKIN CHEESECAKE BARS ALREADY! 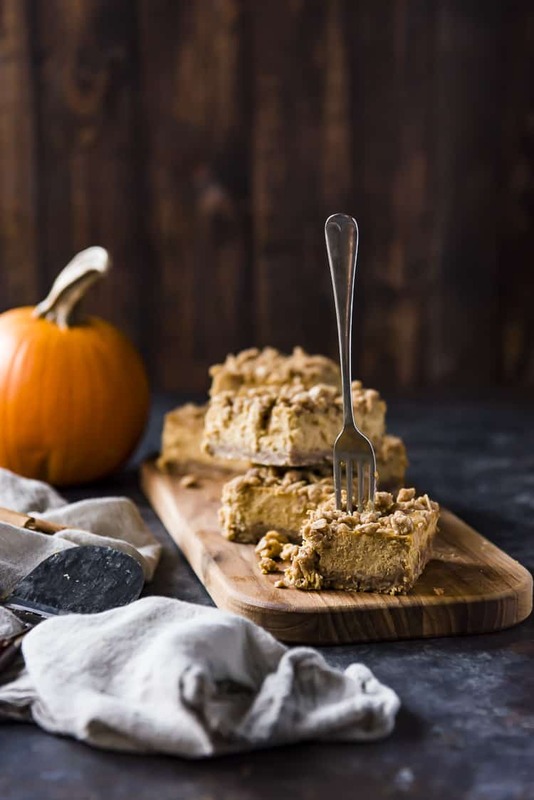 If you’d rather skip my (pretty darn helpful) tips and tricks, essential cooking info, and similar recipe ideas – and get straight to this deliciously easy pumpkin bars recipe, just scroll right on down to the bottom of the page where you can find the printable recipe card! 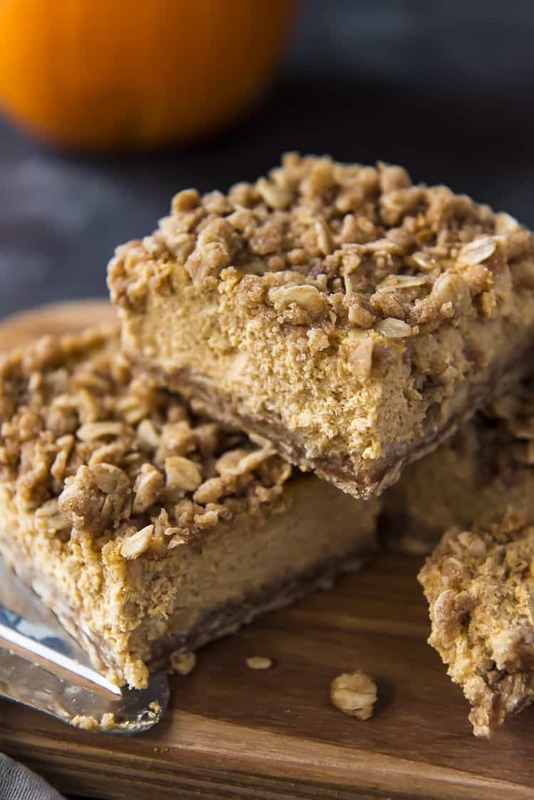 These pumpkin cheesecake bars are seriously the easiest! You can pretty much use one bowl for the entire recipe process. There are no multiple layers to worry about since the pumpkin and cheesecake are blended together. The streusel recipe doubles as the crust AND the topping. It’s a fabulously simple and majorly tasty dessert for every party this fall! Not only do these cheesecake bars bake up in less than an hour, there’s no need to worry about cracking thanks to the streusel. AND?! The recipe is a cinch to double for large crowds. What Ingredients Go Into Pumpkin Cheesecake Bars? Next, mix up your streusel. Combine flour, oats, brown sugar, cinnamon, baking powder, and salt in a bowl. Pour some melted butter over it and mix it up until it combines and begins to clump. Then, spread 3/4 of the mixture in the prepared baking pan. Press it down firmly into an even layer and bake for 10 minutes. While the crust bakes, mix up the pumpkin cheesecake filling. Combine cream cheese, pumpkin puree, sugar, eggs, sour cream, pumpkin spice, vanilla, and salt in a large bowl. Blend it all together until it’s completely combined, but take care not to overmix it. Finally, pour the filling into the slightly cooled crust. Sprinkle the rest of the streusel on top and bake about 35 minutes until the edges are set and the center is still slightly jiggly. How Do You Know When Cheesecake Bars Are Done? Testing pumpkin cheesecake bars for doneness is very similar to how you would test and ordinary cheesecake. Resist the urge to test using a knife, and instead take a peek at it. The outer edges should be puffy and lightly browned, while the center will retain a slight wobble. It should not be wet or soupy, however. At this point, turn off the oven and prop it open with the handle of a wooden spoon. The bars will continue to bake as the temperature comes down. 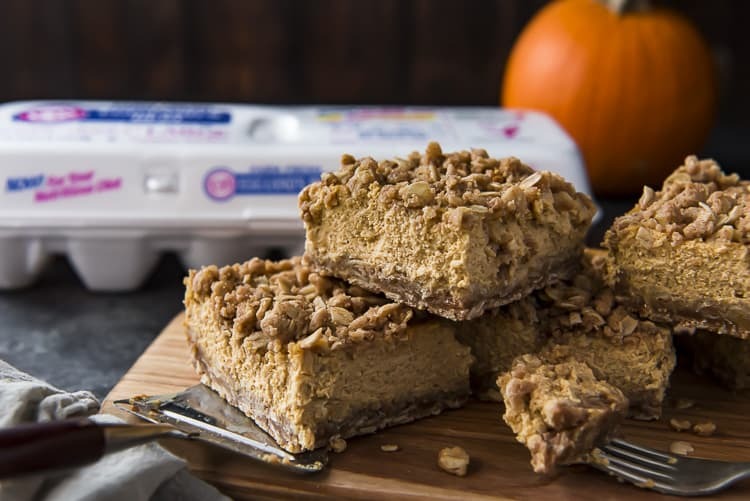 When properly stored, these pumpkin cheesecake bars can last all season long! After the bars have cooled to room temperature, cover the pan loosely with a layer of both plastic wrap and aluminum foil. Place in the refrigerator and chill for at least 6 hours. For best taste, eat within 1 week. You can also freeze these bars for up to 3 months. Wrap the pan (or plate) tightly with a layer of both plastic wrap and aluminum foil, then place in a heavy-duty plastic freezer bag. Remove as much air as possible before sealing. 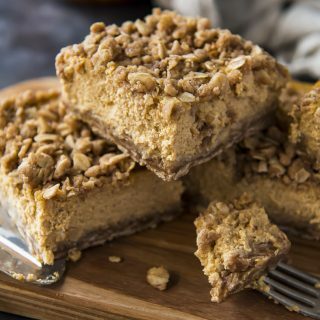 Can These Pumpkin Cheesecake Bars Be Made Keto? My best friend and business partner is a dietitian specializing in ketogenic diets, and I’ve learned a ton from her about keto desserts! In the streusel, use an equal amount of almond flour vs. all-purpose flour. Opt for gluten free rolled oats if possible. For the brown sugar, use a low carb brown sugar substitute, or add 1 teaspoon maple extract and 1 teaspoon liquid stevia to 1 cup of granulated erythritol. In the cheesecake filling, use granulated erythritol in place of the sugar. You can also add 5-10 drops of liquid stevia depending on your tastes. Everything else stays exactly the same! Having made a similar keto pumpkin cheesecake recipe in the past, I can promise that you’re going to love them! 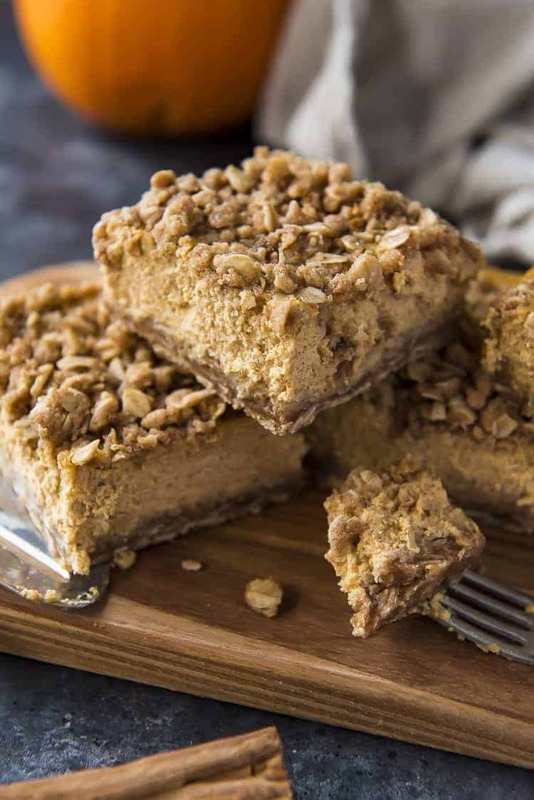 WATCH ME MAKE THESE PUMPKIN CHEESECAKE STREUSEL BARS! 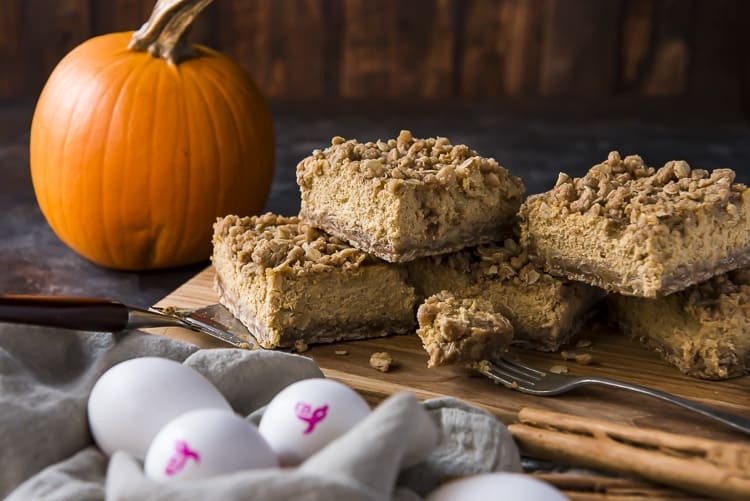 Delightful autumn flavors shine in these streusel-topped Pumpkin Cheesecake Bars! 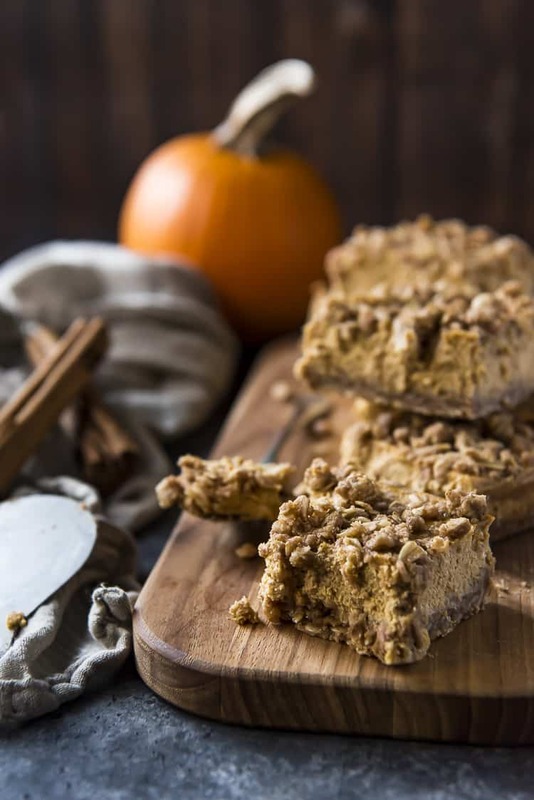 Creamy, smooth pumpkin cheesecake is baked in an oat-based crumble crust, then sprinkled with crunchy streusel - these bars might just be your new favorite fall dessert! Preheat the oven to 350 degrees F. Lightly grease an 8x8 baking sheet, then line with parchment paper and set aside. In a large bowl, whisk together the flour, oatmeal, brown sugar, cinnamon, baking powder, and salt. Add melted butter to the bowl and mix with a spoon until well combined. Spread ¾ of the crumble mixture into an even layer in the bottom of the prepared pan. Bake for 10 minutes, then allow to cool. In another large bowl with a hand mixer, or in a stand mixer, beat the cream cheese and sugar together for 3 minutes until well combined. Add the eggs and vanilla and beat to combine. Add the remaining ingredients and mix until combined, but do not overmix. Pour the cheesecake batter over the crust in the pan and spread in an even layer. Sprinkle half of the remaining crumble dough over the batter. Bake for 20 minutes, then carefully sprinkle the remaining crumble over the cheesecake. Bake another 12-18 minutes, or until the cheesecake is just set (the edges will be set, the middle will have a slight wobble to it, but not be liquidy). Turn off the oven and crack the door, holding it open with the handle of a wooden spoon. Allow cheesecake to slowly cool in oven for 1 hour, then remove and place in refrigerator. Chill 6 hours to overnight until cold before serving. 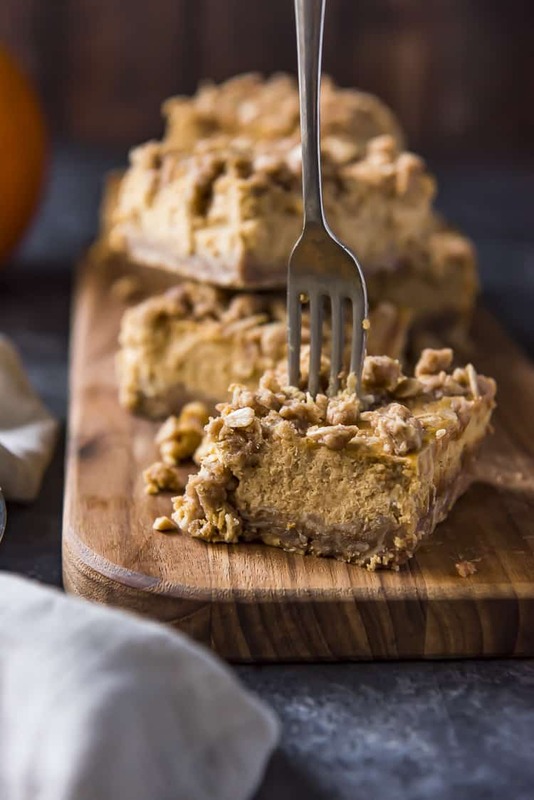 PIN THESE PUMPKIN CHEESECAKE BARS FOR LATER! Love your presentation very much ! Pinned !